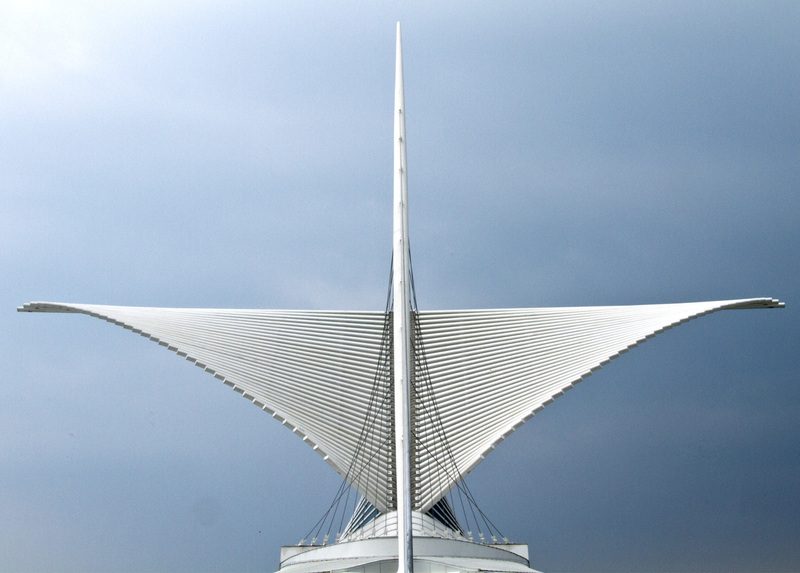 Exterior shots of the Milwaukee Art Museum, designed by Spanish architect Santiago Colatrava and the centerpiece of the Quadracci Pavilion. 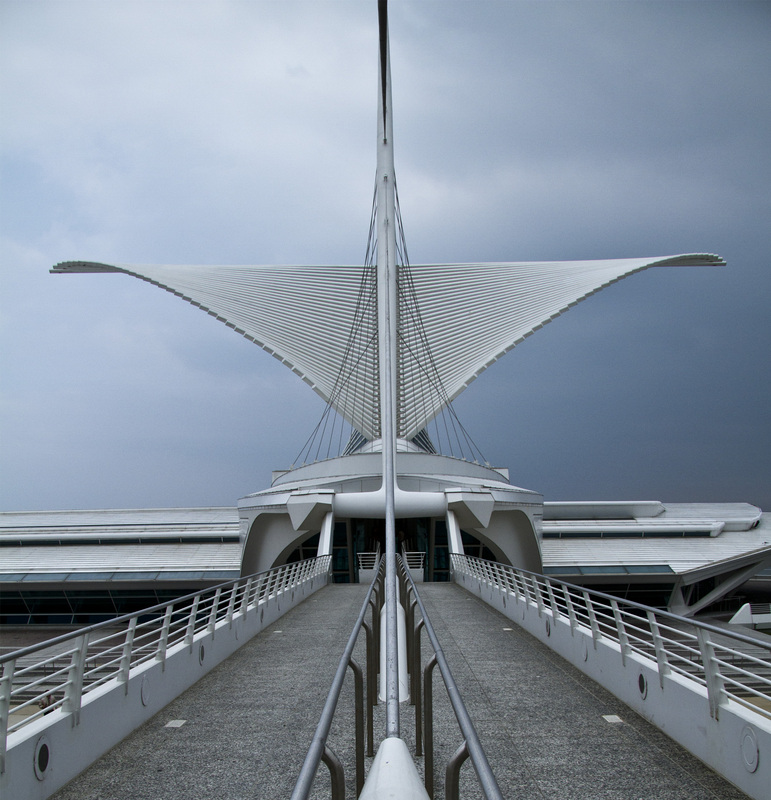 The Burke Brise Soleil is a movable wing-like sunscreen on the top of the Museum. The soleil has the wingspan of a Boeing 747 and is breathtakingly gorgeous from any angle. We were there for the closing of the soleil one morning. 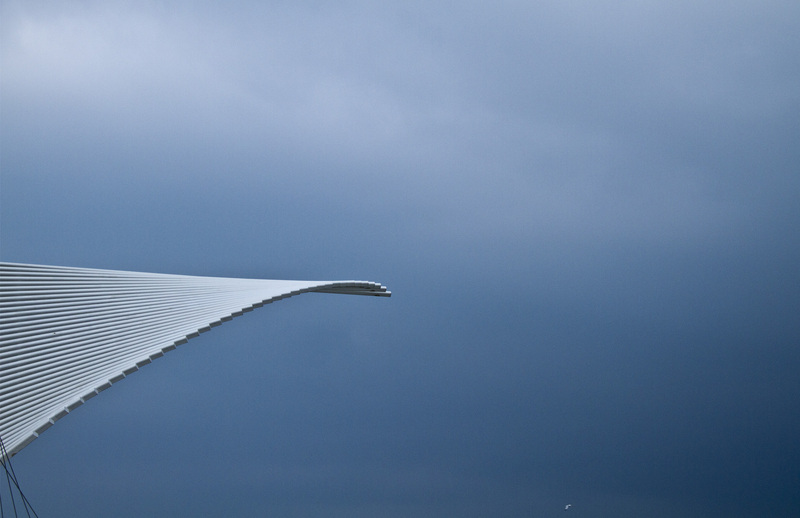 The movement was so slow and delicate, it was barely perceptible: an act of pure beauty as it quietly folded in on itself like a huge and mythical bird. How, you might ask, did I manage to get such a centered and spot-on shot? Well, it involved climbing inside that little divider (no easy task) and standing there for a few minutes, waiting for folks to walk past me and all the while feeling like an over-sized less-than-bright toddler who had wandered away from the rest of the group and gotten herself hopelessly stuck. Then, with a clear shot mine for the taking, I was forced to yell at some guy who exited the building at precisely the wrong moment. He hurried up–just a little–proving that my teacher voice is no more effective on grown-ups than it is on middle-schoolers. Bottom edge, about a third of the way from the right side: gull. Did not plan that, but what nice synchronicity. Oh wait–I must have planned that. I just didn’t realize it at the time.